‘Tender first’ for Bala Lake! THE Bala Lake Railway operated its first passenger trains to be hauled by a tender locomotive in the route’s narrow gauge era when 1863-built George England 0-4-0STT Palmerston visited for a week on June 18. A tender locomotive has not worked a passenger turn along the shore of Wales’ largest natural lake since Manors and Standard 4MT 4-6-0s graced the GWR Ruabon to Barmouth route before BR closed it in 1965. BLR manager David Jones said: “The Hunslet 100 gala of 1993 remains a memorable event in the Ffestiniog & Welsh Highland Railway’s history. F&WHR general manager Paul Lewin called me and explained that plans were afoot to go one better in 2018 with the Hunslet 125 gala (feature, page 50). “He enquired about borrowing locos from us. When I asked which ones, he requested all of them. That would have left us with no steam locomotives to operate our service, so it was agreed that Palmerston would visit the BLR. 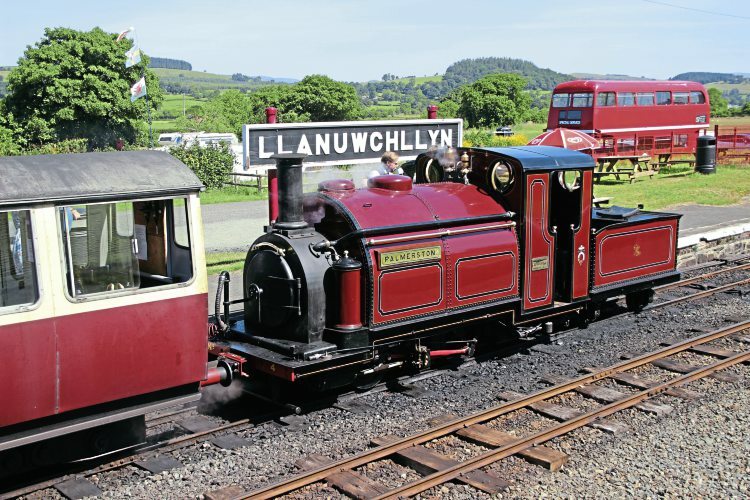 In the spirit of co-operation between the two Snowdonian lines, the BLR moved its annual steam gala from its traditional August bank holiday slot to the weekend of June 16-18, allowing two visiting locomotives to attend its event prior to moving on to Hunslet 125.